If you have been following ChicLifeByte (my Instagram), you would know of our luxurious trip to Thailand. 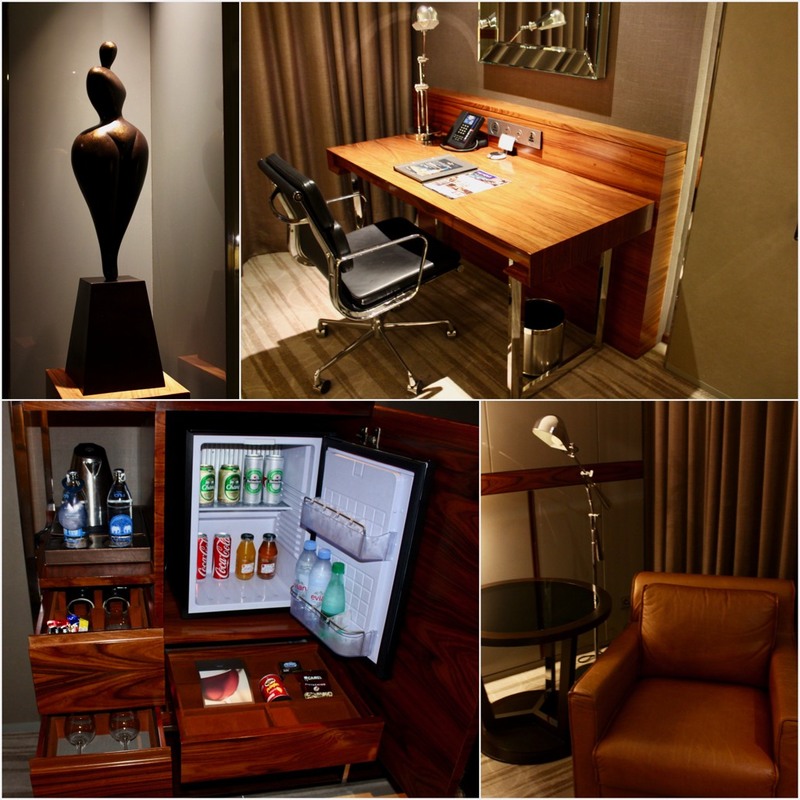 This post is to tell you about an amazing time we spent enjoying the hospitality of Hilton Sukhumvit Bangkok. 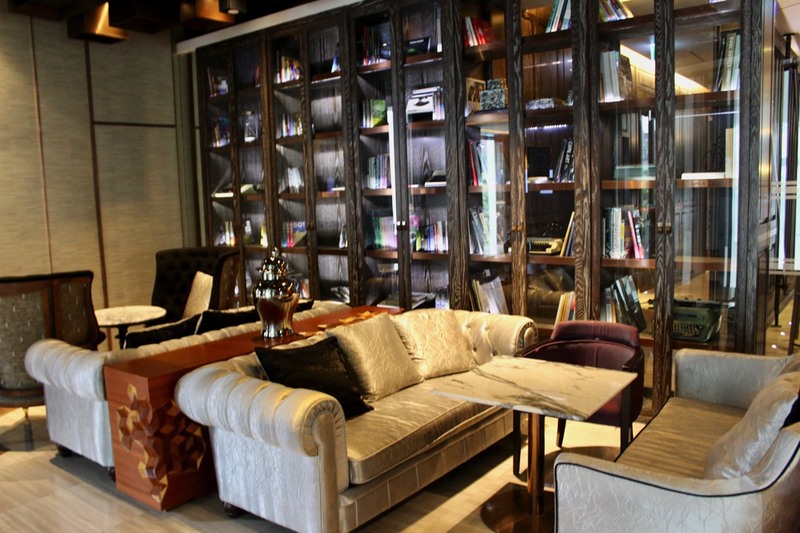 The beautiful, posh and luxurious hotel is known for its central location and modern day dining options. 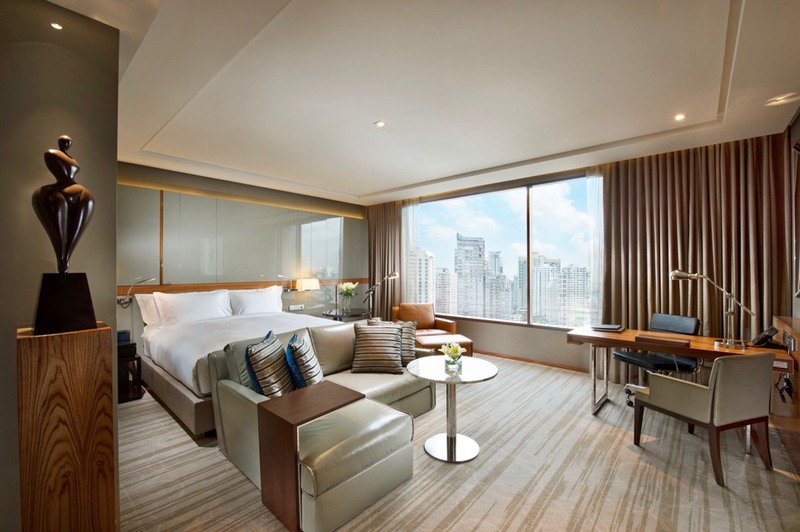 Strategically located in the heart of prestigious Sukhumvit Road and next to Phrom Phong BTS SkyTrain station, Hilton Sukhumvit Bangkok provides convenient access to the city’s entertainment, business and shopping centers with unparalleled reach to the most popular destinations. It is also the regional winner in the luxury hotel brand category at the World Luxury Hotel Awards 2016 held in Qatar. And our excitement knew no bounds as we were ready to explore the hotel! 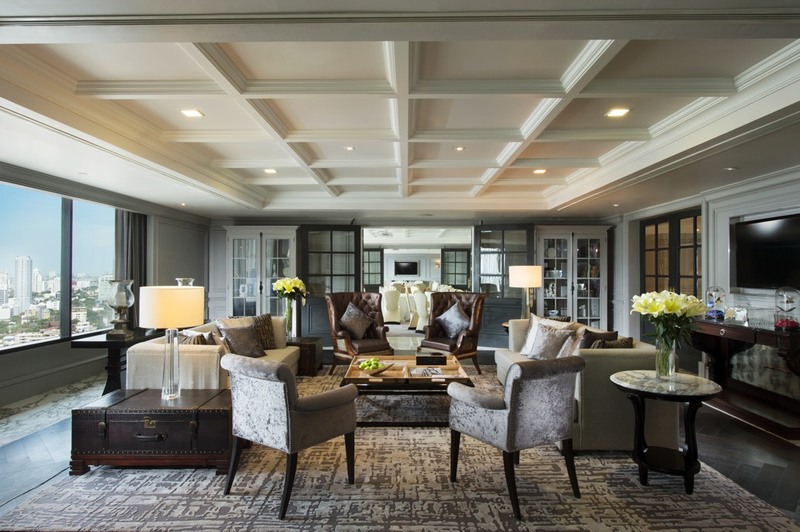 As we entered the hotel, it felt so welcoming with its interiors done in grey and white. The interiors are actually inspired by American Prohibition during the 1930’s when Italians immigrated to America and created Little Italy in NYC. 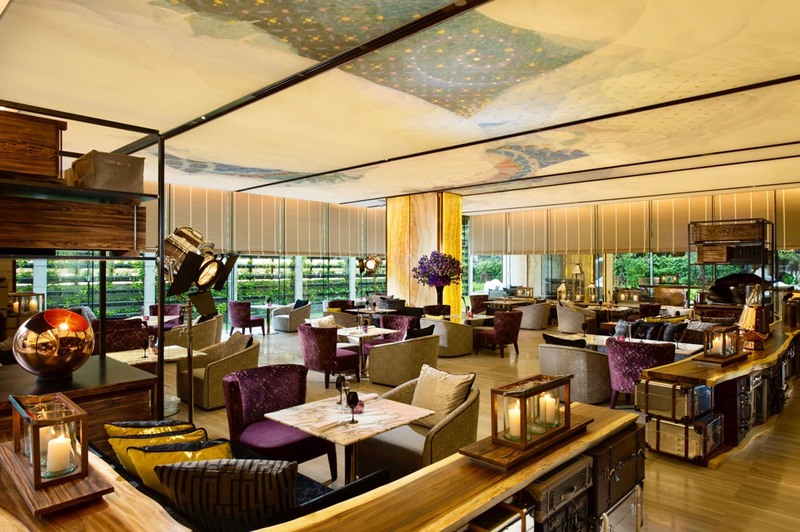 Hilton Sukhumvit Bangkok, with 280 guest rooms, has been wowing guests and visitors with its sensational interior design. There are six room types designed for guests keeping in mind different requirements of an individual or a family. 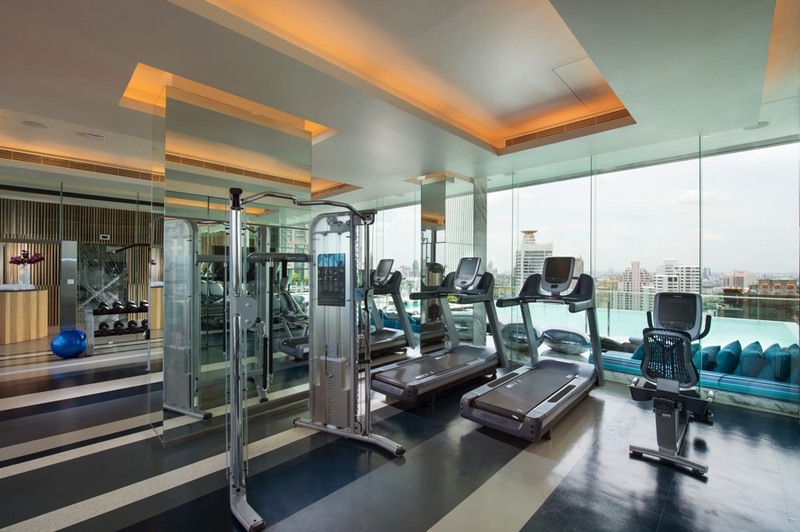 At Hilton Sukhumvit Bangkok, you can enjoy the ideal space suited as per your needs. Isn’t that wonderful? We settled for a King Deluxe room which was done up in earthy colours and was a delight in itself! Everything was just perfect and spotless. In addition to the king size bed, there was also a comfortable large couch and also an armchair and a table where one can sit and adore the beautiful view through the glass pane behind the curtains or enjoy the TV show or music on the large flat screen television set. 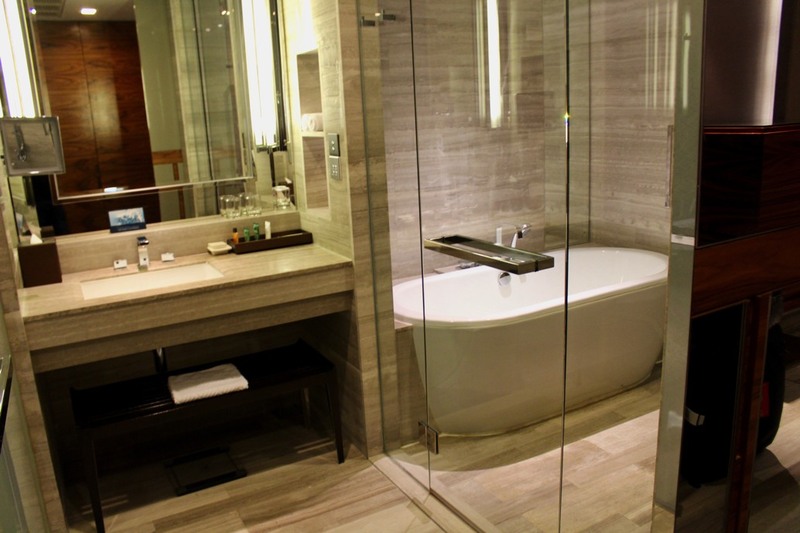 Another highlight of the room was modern and stylish bathroom which had a walk in shower and a comfortable and nice bath tub along with which there was a privacy blind that could be lowered. 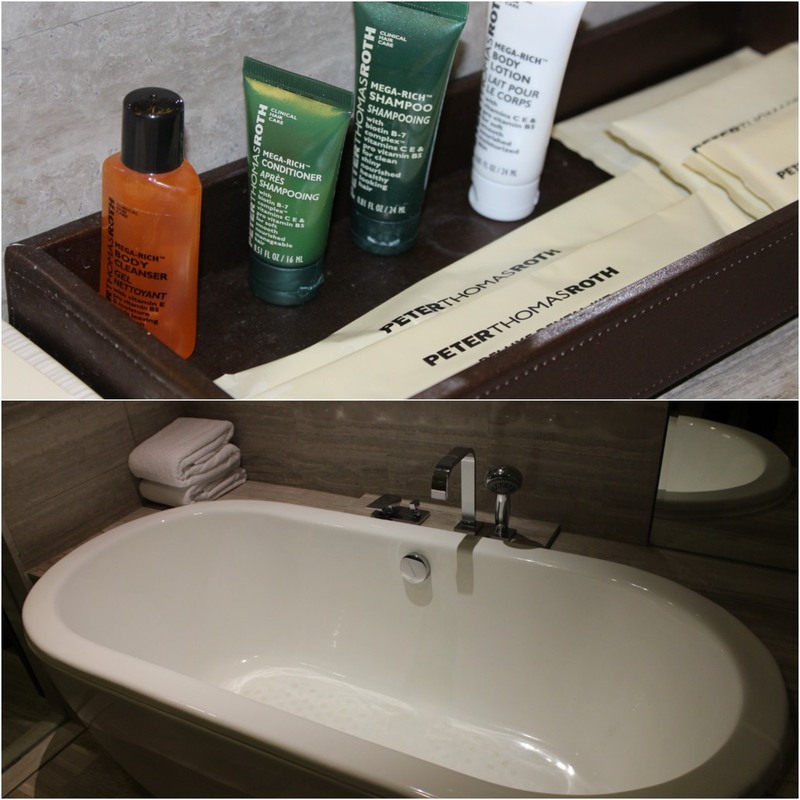 There was also a detached toilet.We loved getting pampered with toiletries from Peter Thomas Roth, the highly sought-after products helped us relax while keeping our hair and skin looking fresh and nice! Six new products by skin care mogul Peter Thomas Roth are exclusively available to travellers while they stay at Hilton. Even the suites have different categorization-King Executive Suite, King Junior Suite, King Presidential Suite, Twin Executive Suite and Twin Junior Suite which offer luxurious facilities and amenities according to various requirements. The spacious functional spaces are great for people on the go who want to relax and unwind in style. Even the Executive rooms offer a choice of King Executive room and Twin executive rooms where one can unwind in the spacious and bright room which benefits from natural light from the large windows with an option to access the executive lounge and receive a complimentary breakfast, afternoon tea and evening cocktails. 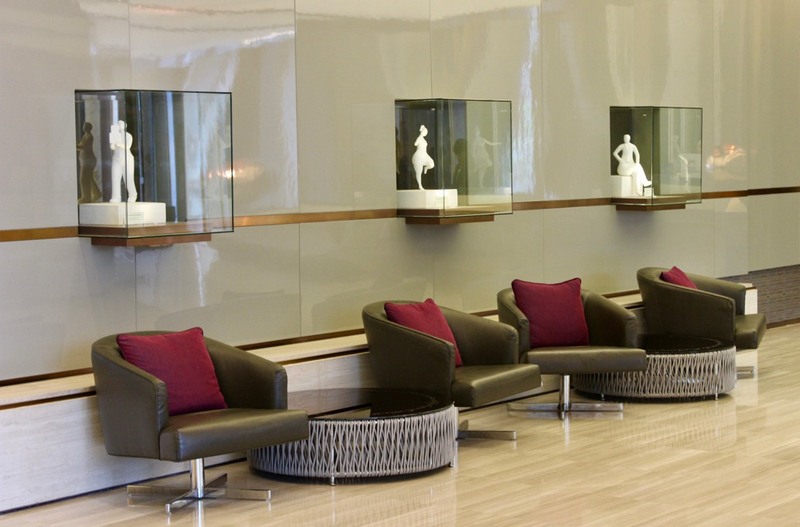 The Suites and Executive Level guests are also entitled to two hours use of the meeting room per stay. It’s not only the awards and the rooms which impressed us but we were fascinated by a hypothetical and romantic fairy tale which has been an inspiration to the whole theme of the hotel. It is the story of Jay and Daisy who first met when they were both travelling to Thailand by ship. Our man Jay brought a shipload of suitcases containing everything he had (which one could find scattered throughout the hotel) while Daisy brought only her dog Mali and a few books (Do check out the portrait of Daisy walking Mali at the lobby). We know opposites attract! Jay who hailed from Italian descent had moved to America with his family when he was a kid, decided to explore Asia and chose Thailand as the starting point. Our lady Daisy moved to Bangkok at the same time. A New York’s socialite who got restless from the city decided to take her poodle Mali, and leave everything behind in search of a new life and love. 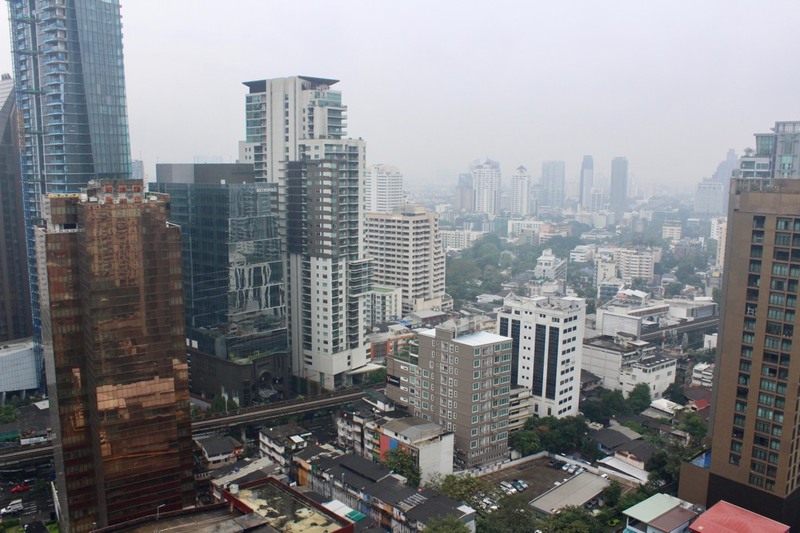 Jay and Daisy both moved into the hotel and started spending time together exploring the streets of Bangkok, discovering the hidden treasures across various markets. Our man fell for Daisy with all his heart and as a true gentleman also brought her two giant gemstones as a display of everlasting love. 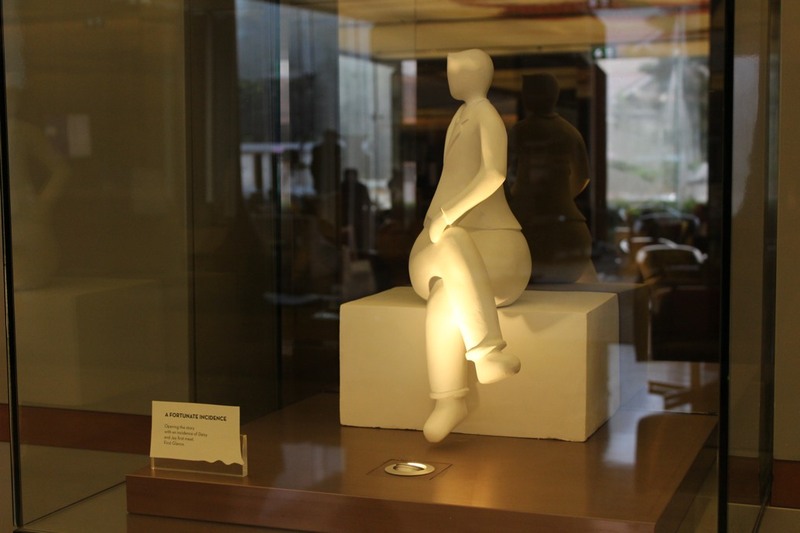 One of these can be seen at the hotel too! Don’t be surprised to see the stunning big rock! If you wander over the ceiling done up in hues of blue and red, it was the idea of Jay who commissioned Professor Krengkai, a famous Thai artist to paint abstract murals on the ceiling that showed the evolution of their love from cold blue to hot red. 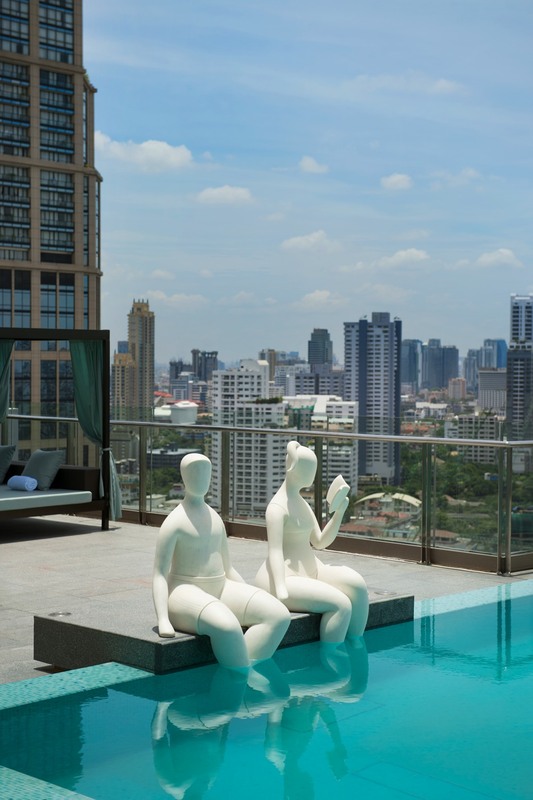 The rooftop infinity pool, Lapse was another thing that brought a great smile to our faces and you cannot miss out on Jay and Daisy relaxing at the pool taking in the warm weather together and escaping the busy streets of Bangkok! 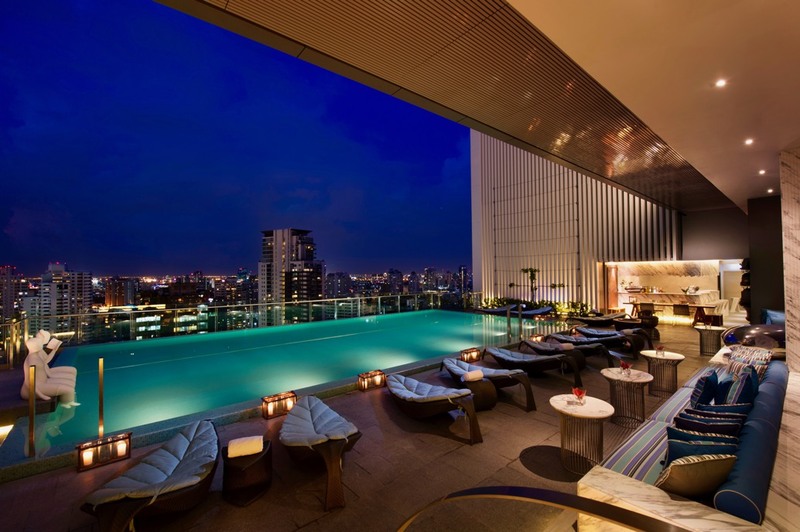 Once you have cherished them, you could take a dip in the beautiful infinity pool, while sipping on a cocktail and admiring Bangkok’s skyline. Also, the 24-hour fitness center offers weight and cardio equipment so you can keep up with your workout schedule while here. The hotel features a host of interactive dining venues, state-of-the-art meeting facilities as well as contemporary rooms and modern amenities, this is the perfect base for business and leisure travellers alike. 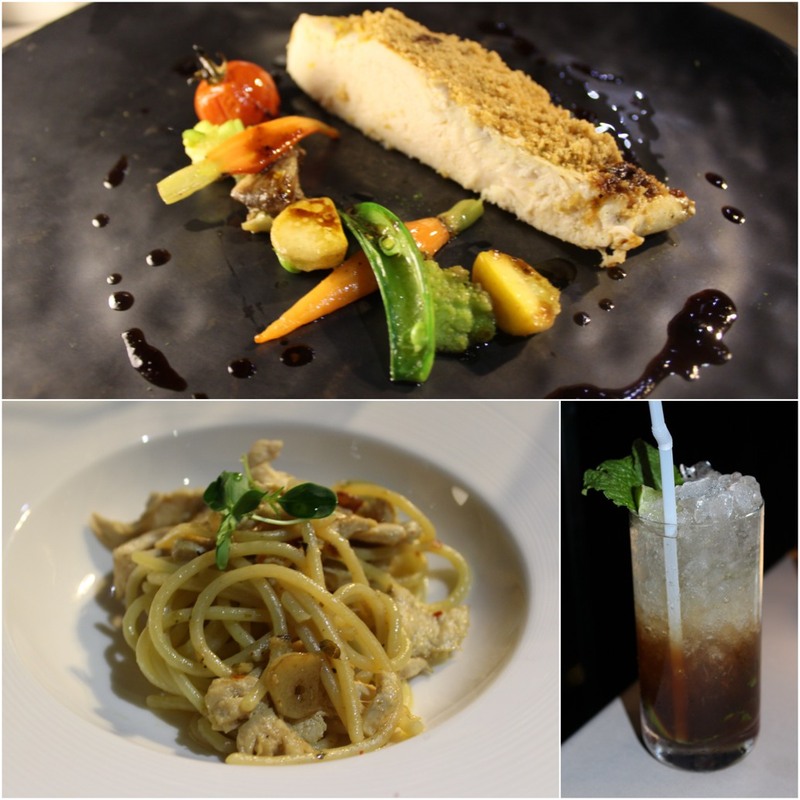 The first meal we had at the lavish property was dinner at the beautiful and renowned modern Italian restaurant SCALINI which has won numerous awards as well. The restaurant staff made sure we had a nice time and left no stone unturned for a pleasurable meal. Interestingly, this was also Jay and Daisy’s place for hosting their new friends, sharing recipes and flavours from when they were both kids in New York City during 1920’s and 30’s. Our first look around the place was about differential seating, colourful chairs, plush couches and chairs! We chose a nice comfortable table along the glass panel. Some walls adorned beautiful sketch of New York’s skyline while other walls adorned glass panels. The dim light concept restaurant made a great first impression. 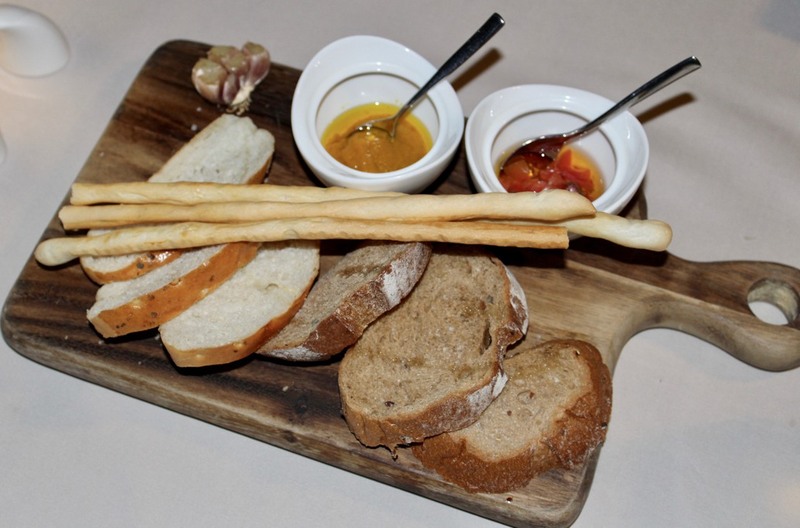 To welcome us there was a platter of Italian breads accompanied with soup sticks, tomato and pumpkin sauce! We were really hungry and this was a great start. 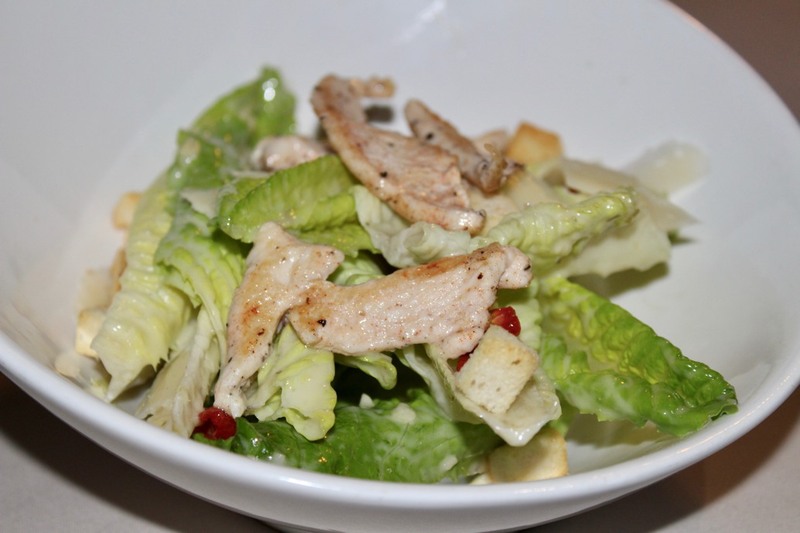 Next was our appetizer – the Scalini Caeser Salad which was a refresher! We requested the server to remove bacon and keep only chicken in the salad. The crispy crumbs along with lettuce, cheese and chicken made a nice nutritious refreshing salad. The Vegetables soup which had Ligurian vegetables with 36 month aged parmigiano reggiano cheese gave us the required warmth. Nice boiled veggies added the flavours and density and also made the soup more colourful. Being not too fond of seafood, I requested the server if we can have a plain spaghetti with chicken and to our pleasant surprise she agreed. The chef added his magical touch and made a wonderful spaghetti. The main course we chose was Crispy chicken breast, black truffle sauce (Cast iron chicken breast with shimeji mushrooms, artichoke & garlic in black truffle sauce) which looked lovely with a piece of chicken breast beautifully placed on a plank with colourful boiled vegetables on the side! It was delicious as well! To go along with the food was Nojito, our lovely mocktail which was made with mint leaves, brown sugar, lime juice and soda. It was full of nice flavours. 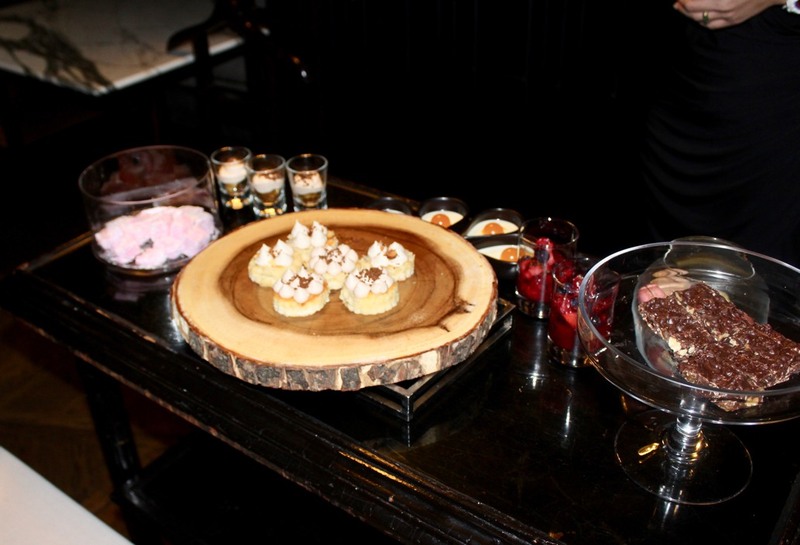 For desserts, there was a wonderful concept where we could choose any 3/6/12 things from a wide assortment of vanilla pannacotta, mango salsa, chocolate tart, lemon flavoured creme brulee, banana tart, almond pear tart, wild berries, chocolate truffles, marshmallows and macaroons. Though we were allowed 6 but we got 1 more from the wonderful assortment, thanks to our gracious host. 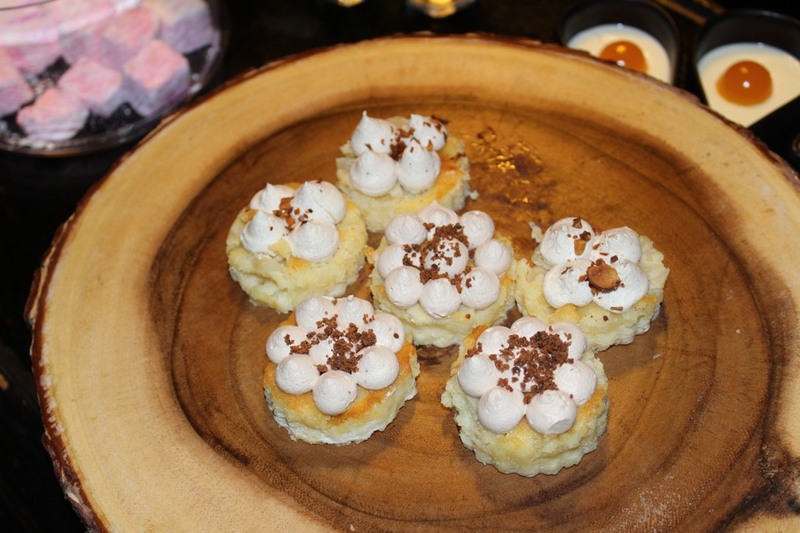 Each one had their own perfect sweetness! 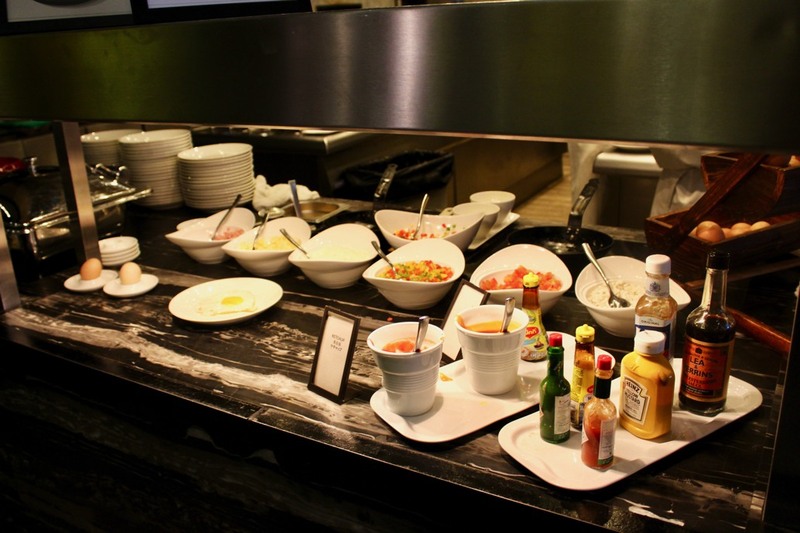 Breakfast was at Scalini too where there was a large buffet spread. 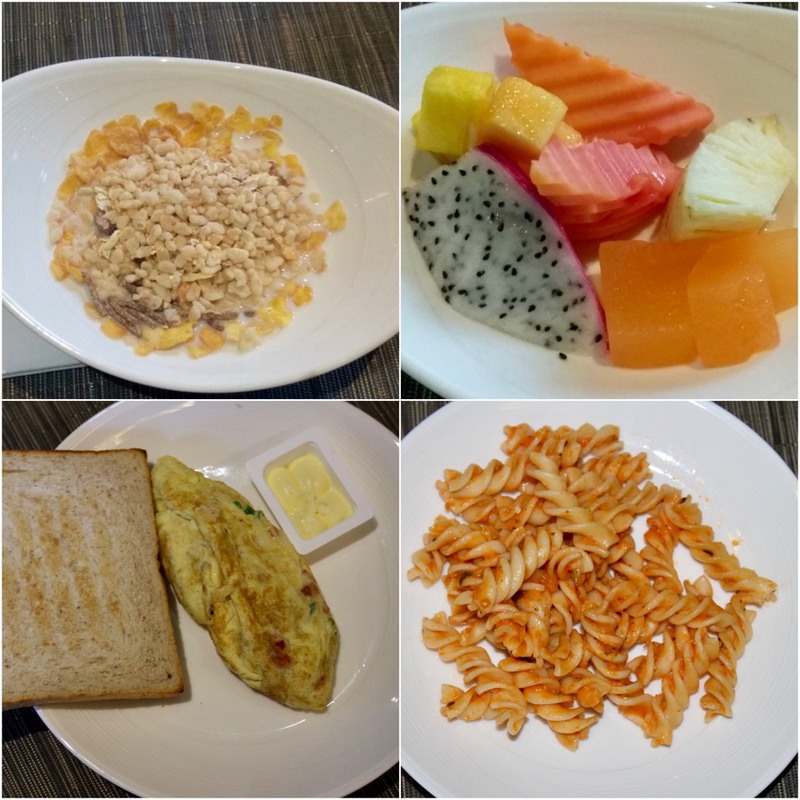 We started with milk with cornflakes followed by a plate of colourful & fresh fruits. Next to order was something which we cannot miss out and that is made at the Live Counter. How can you travel and not eat omlette made in front of your eyes as per our requirement. I requested the chef to make a spicy masala omlette and I am so glad the chef added the right spices to get me the Indian taste which I relished with toasted bread. Breakfast at an Italian restaurant is incomplete if you don’t have anything Italian. So we picked pink sauce pasta which was a part of the breakfast buffet. I found it a little sweet so I added Tabasco and chilli sauce to make it a little hot! Now that you see an assortment of desserts, how can you not have them! 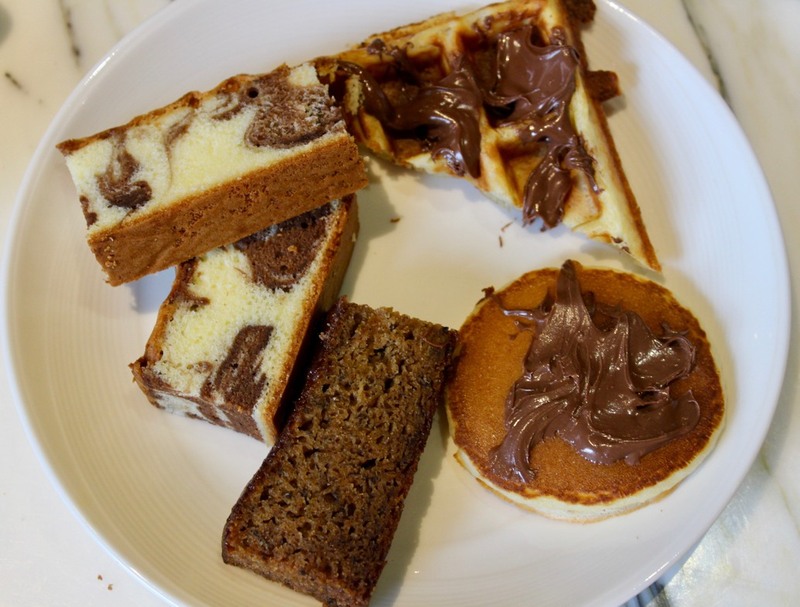 So without much ado, we picked pancakes, waffles, chocolate cake, banana and chocolate cake. I added a little Nutella on the first two desserts not being guilty of the extra calories as I had a long day and I knew I needed more energy! To keep me awake I ordered a tea which was light and nice. Our second dinner was a culinary trail around the world that too without moving an inch! 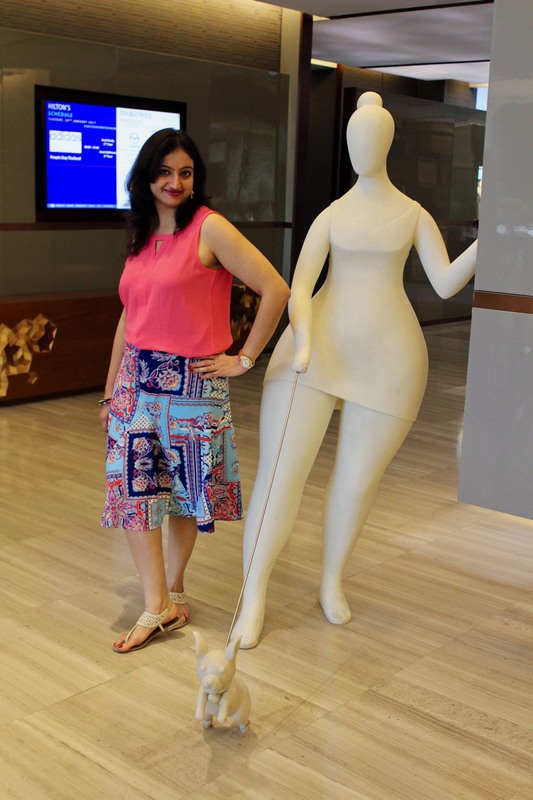 It was at the gorgeous restaurant MONDO which was located at the lobby level itself. At the entrance you will find a couple of suitcases. Don’t be surprised! They are Jay’s luggage which are placed throughout the hotel. There was not enough space to store them anywhere else! At times, Jay and Daisy travelled to see the outlying areas together (How romantic!) and they even escaped a near fatal plane crash on their way to Koh Samui. They salvaged the plane’s propeller for good luck, that you can see at Mondo. A live open kitchen towards the right greets you as you enter the restaurant. With immense seating options from couches, plush sofas to chairs in burgundy, black, greys we made ourselves comfortable on the couch near the window pane. 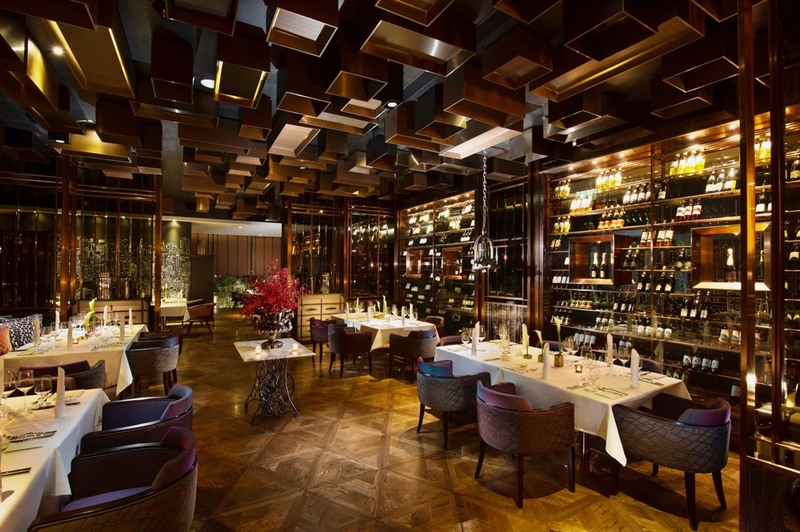 The restaurant also features a charcuterie & cheese tower and a manually operated meat slicer. 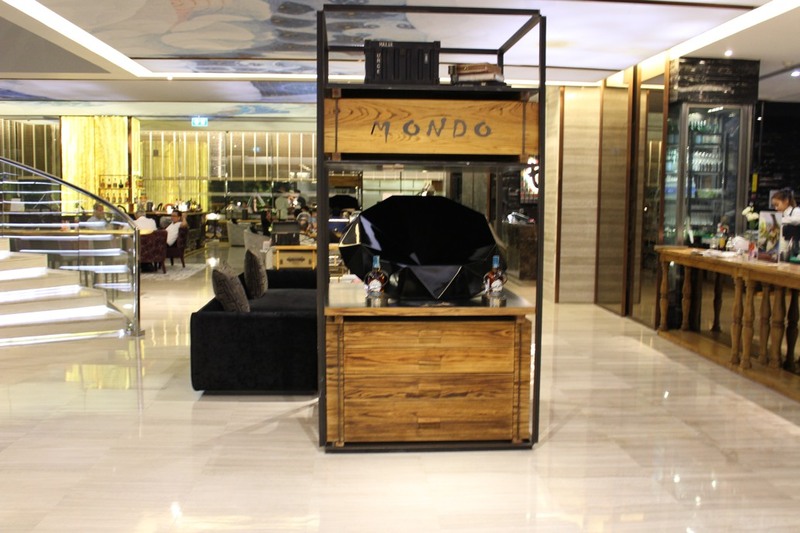 Mondo is known to be the perfect place to meet friends over a bottle of wine and enjoy the selection of savoury food items. We were looking forward to try the large variety of dishes with influences and flavours from all over the Mediterranean and Asia! 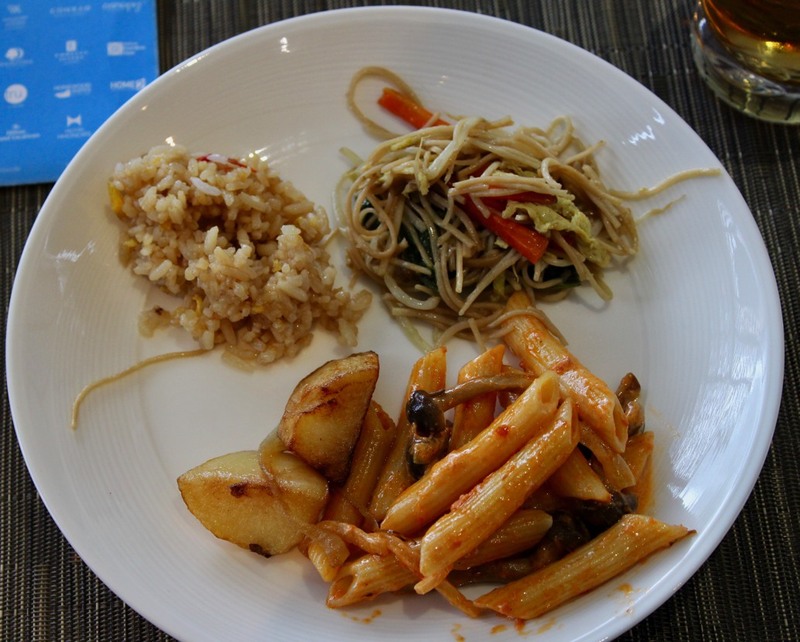 We made sure we choose a variety of cuisines from different countries to get the global taste! 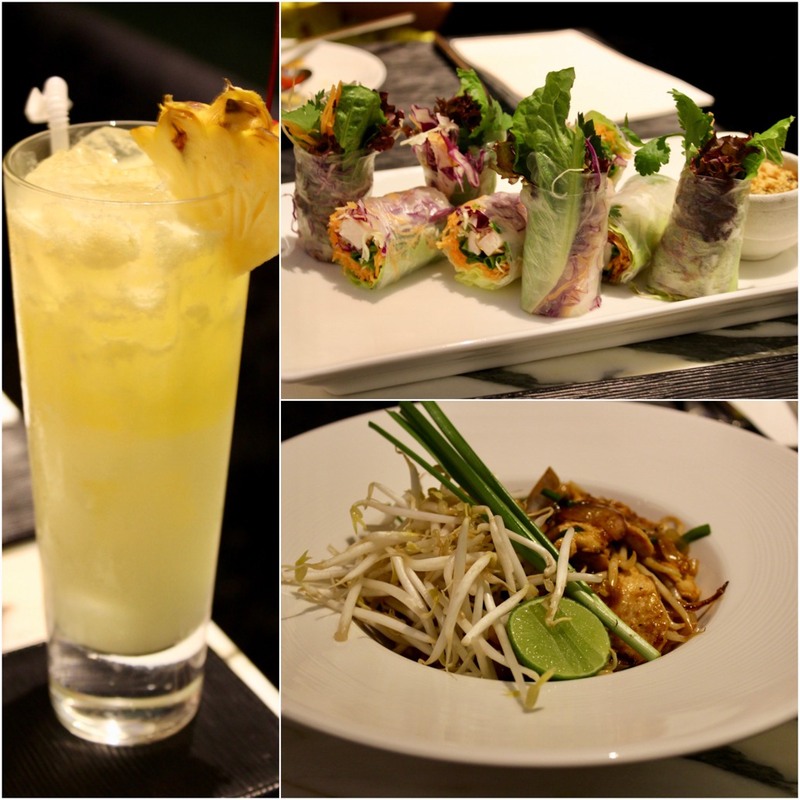 Every dish we had was unique in its own way and we loved the Worldwide culinary ride sitting at the beautiful restaurant at Bangkok! Satay’s from the Grill had chicken marinated and grilled to perfection. 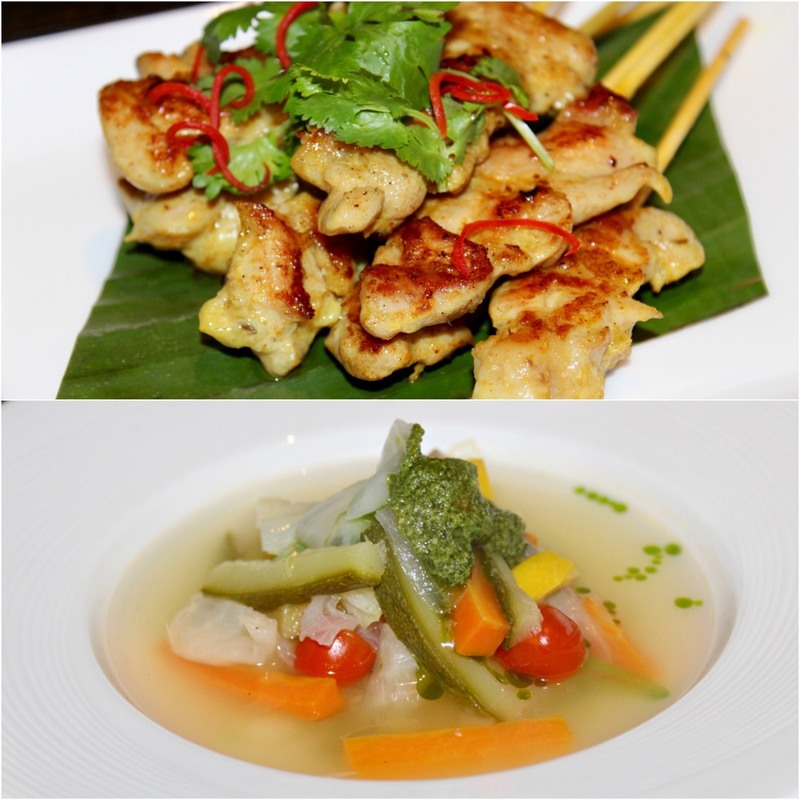 Juicy chicken in the sticks made for a perfect dish which was served with peanut sauce and salad. 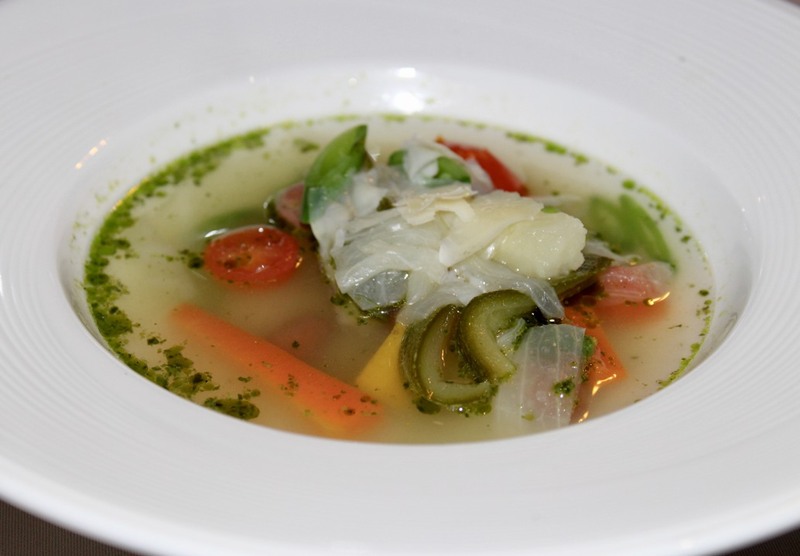 Next dish was Minestrone Soup which was basically liguria vegetable soup with 36 month parmeggiano reggiano cheese. It was nutritious and colourful with the right amount of vegetables. 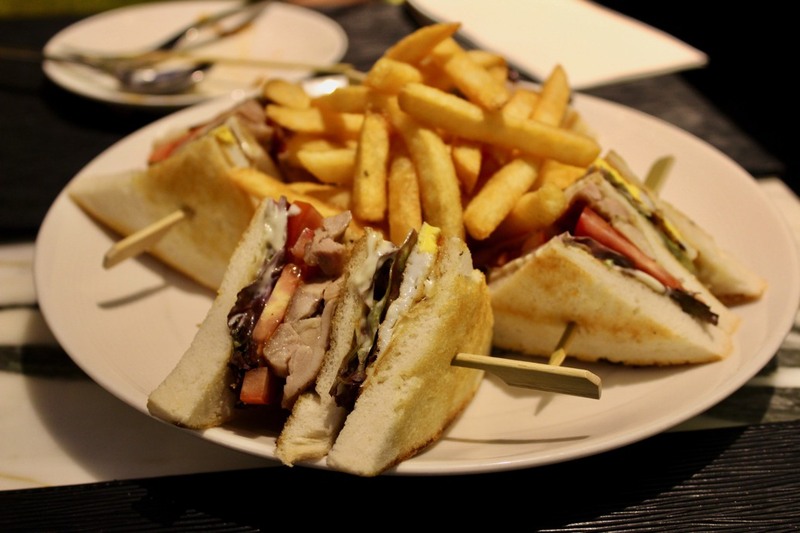 Next, Classic Hilton Club Sandwich was a triple decker sandwich consisting of toasted chicken breast, fried egg and tomatoes served with chips. Distinct flavours and layers in between toasted bread were great to look and eat as well! The dish was well stuffed, delicious and was served with fries and tomatoes. Next was Vietnamese Rice Paper Rolls which was full of marinated chicken, lemongrass and fresh vegetables served with chile lime sauce. I would like to call it a cold salad version, well stuffed, healthy with irresistible flavours! The Phad Thai I had here was the best Pad Thai I have had in entire Thailand! The Phad Thai was described as traditional wok fried noodle with tamarind sauce, bean sauce, shallot, dried turnip and was simply amazing. 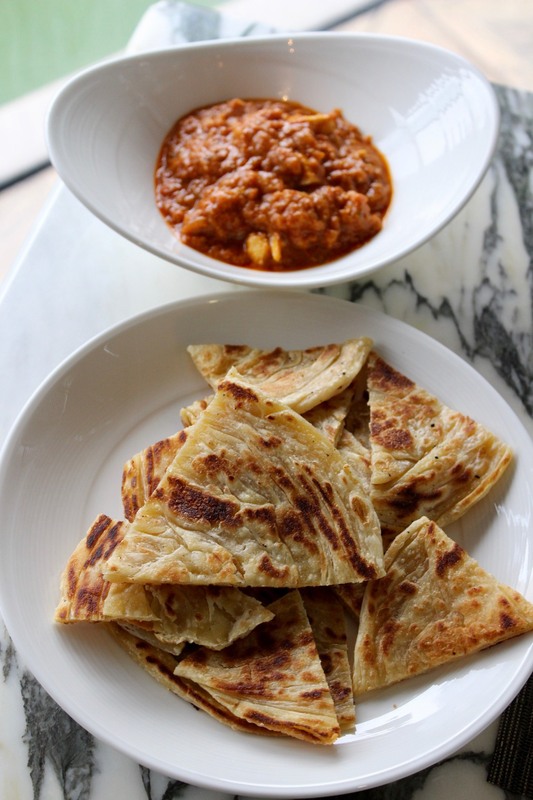 If you want to have a great meal with authentic flavour, this dish is highly recommended! For drinks we ordered Virgin Pina Colada which had cream of coconut, pineapple and lime juice; an enjoyable drink with a great mix! 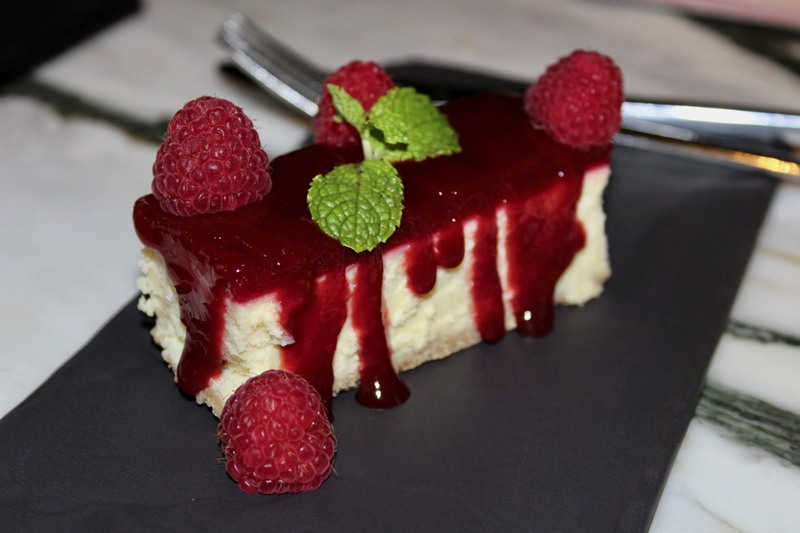 For desserts, we ordered Rasberry Cheesecake Bar which was as delicious as it looked! Topped with raspberry, it was divine! I have always loved Ferrero Rocher chocolates and when I saw a gelato in the same flavour, I was super happy! Yes, a Ferrero Rocher gelato! I totally relished it as I loved every bite! 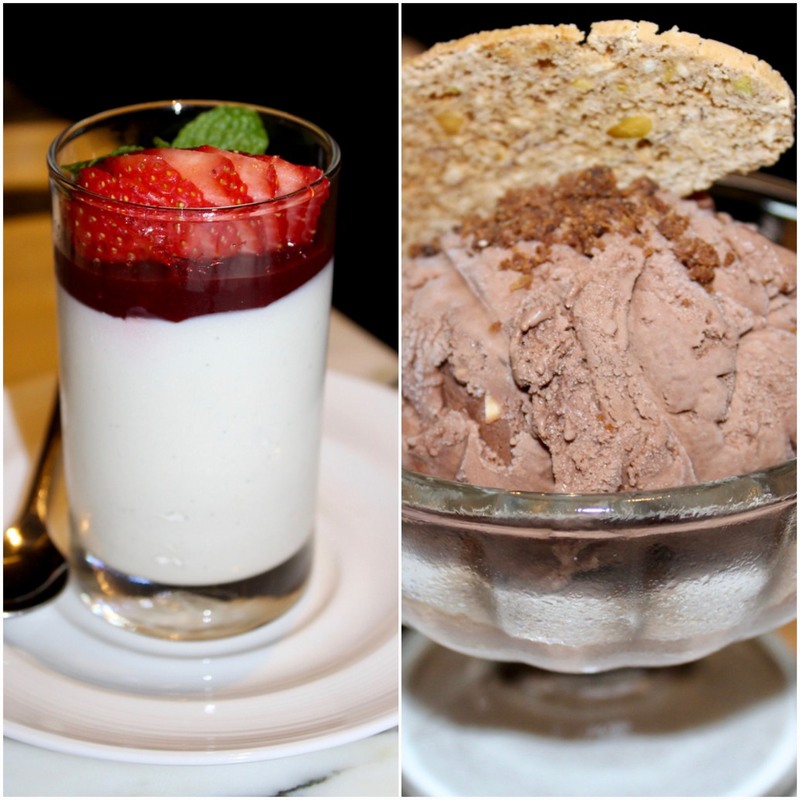 Panna Cotta was topped with strawberries compote which made the dessert super amazing! At the end I would like to say unwind and watch the world, or like Hilton says ‘Mondo’, go by! 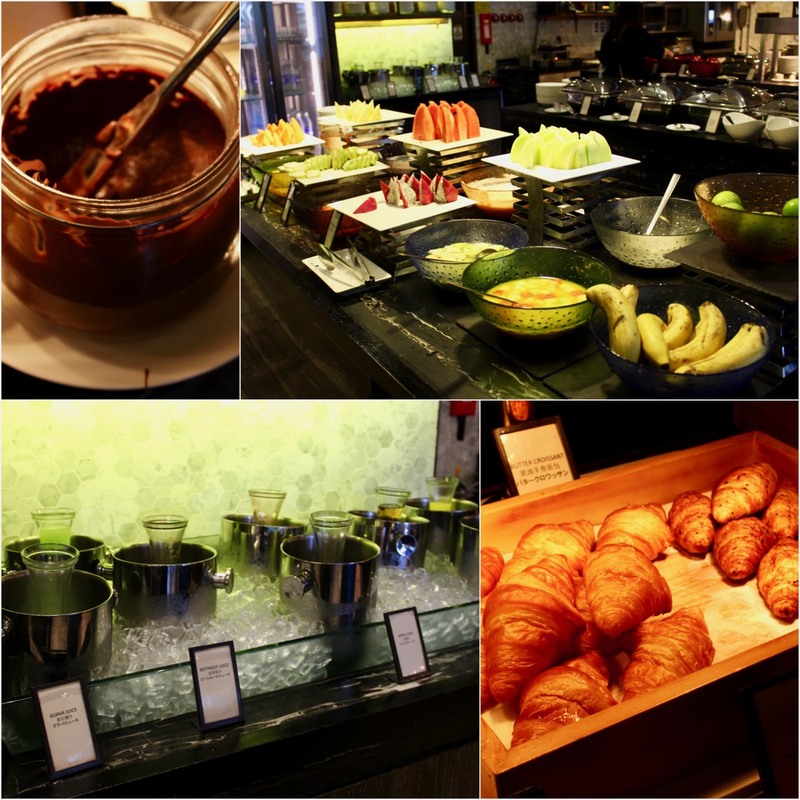 Our second breakfast at Scalini started the usual way where we picked up a few things from the lavish spread which delighted us. Our picks of the morning were penne pasta in pink sauce, roasted potatoes, buttered broccoli and jasmine rice. All of them were great. Now I would tell you about something which would delight any Indian. While browsing the buffet, I saw Paneer butter masala! Wow! I checked around but could not see anything I could eat it with. Eating it with bread would have not been an ideal option so I checked with the chef if they had roti, to my pleasant surprise they arranged it and served the same. It was the best breakfast I had in Bangkok! Post relishing it, I continued with a platter of fruits which were colourful and nice. 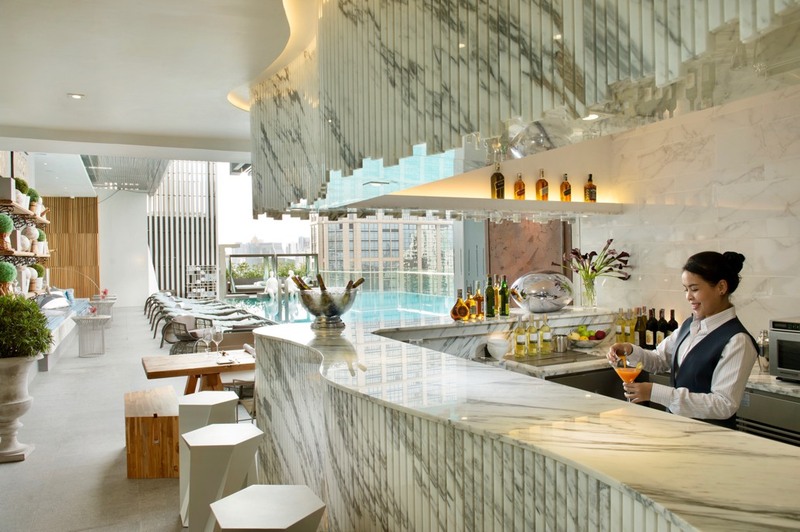 POOL BAR AT LAPSE– Serving a range of beverages, this relaxed and informal bar is the perfect place to enjoy an evening view or the city’s skyline. You can order refreshing cocktails and light snacks while you soak up the sun by the infinity pool. Travelling for work? Worry not! 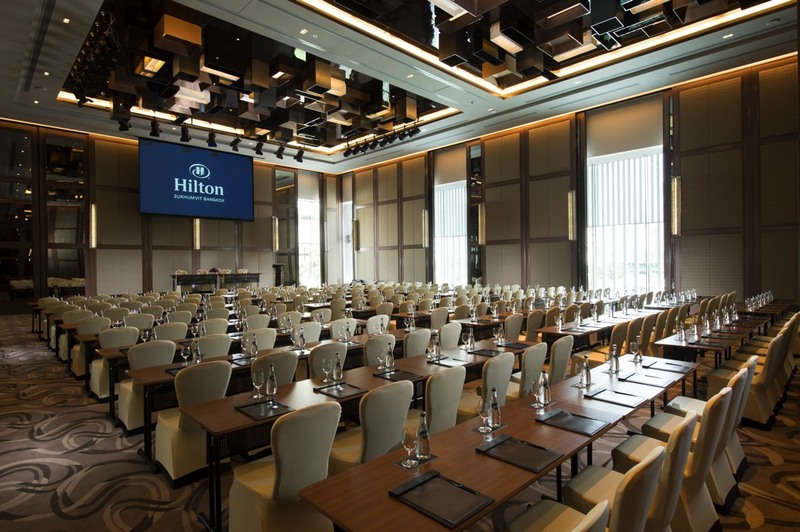 Hilton Sukhumvit has the right space for meetings and events too! 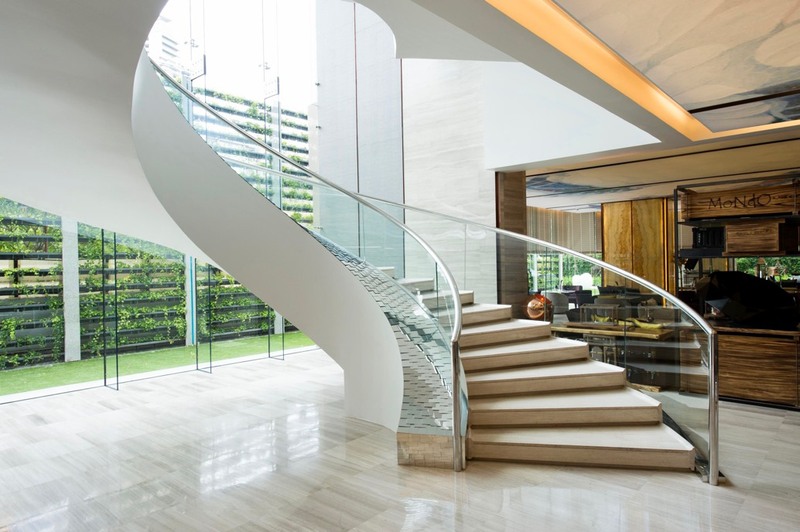 THE SUMMIT: Combining a contemporary penthouse setting, the Summit is the ideal space to host both small and medium-sized functions. 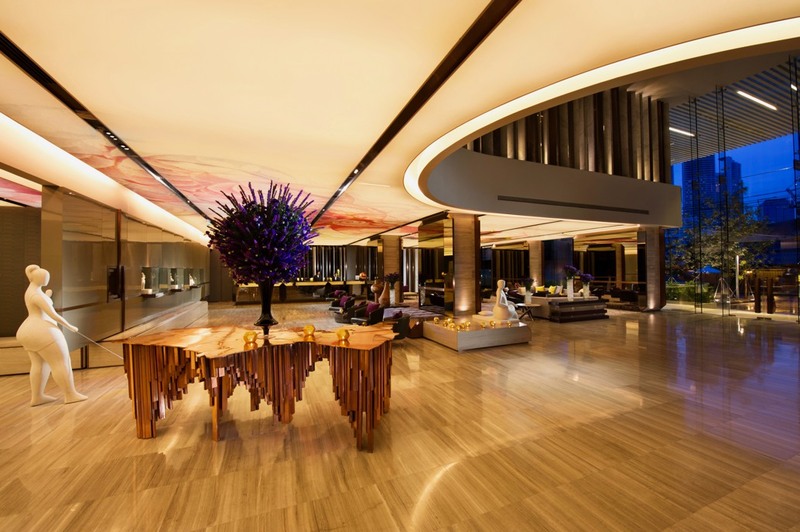 With Bangkok’s skyline as a backdrop, this destination meetings floor redefines urban events with three state-of-the-art venues spanning 55-72m2 each. BALLROOM: Ideal for gala dinners and large events, the Ballroom features a 384m2 large daylight foyer, as well as a 64m2 boardroom. STUDY ROOM: Host interactive and engaging events that feature tailored, innovative dining concepts at the Study Room, a specialised venue with a Bofi kitchen. 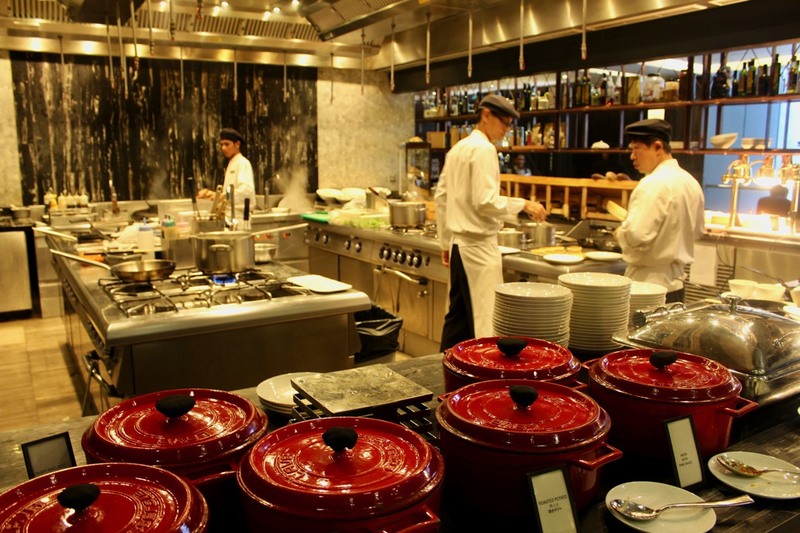 Live cooking and preparation for all meetings and events can take place independently in this interactive, open kitchen. 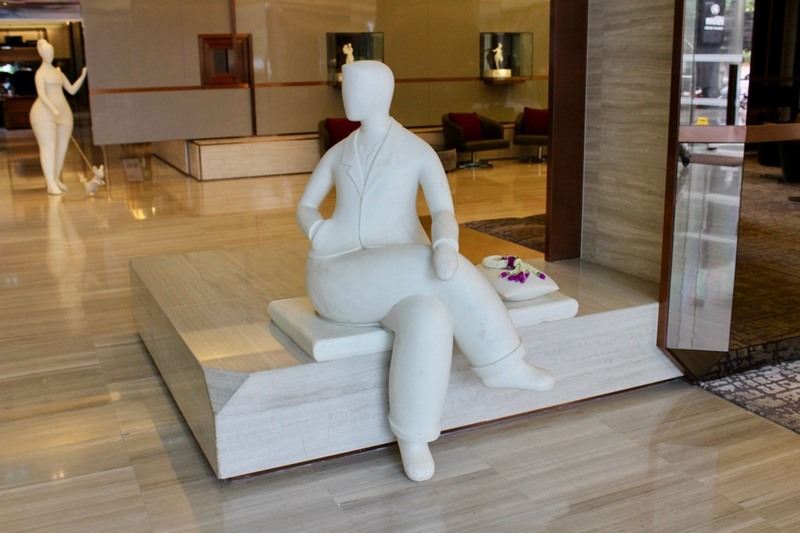 For nearly a century, Hilton Hotels & Resorts has been proudly welcoming the world’s travellers. 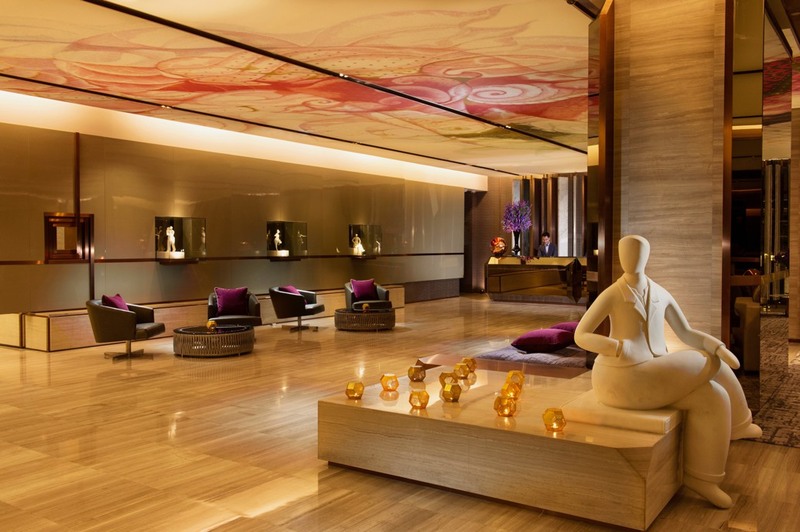 With more than 570 hotels across six continents, Hilton Hotels & Resorts provides the foundation for memorable travel experiences and values every guest who walks through its doors. Thank you Team Hilton for hosting Team ChicLifeByte. 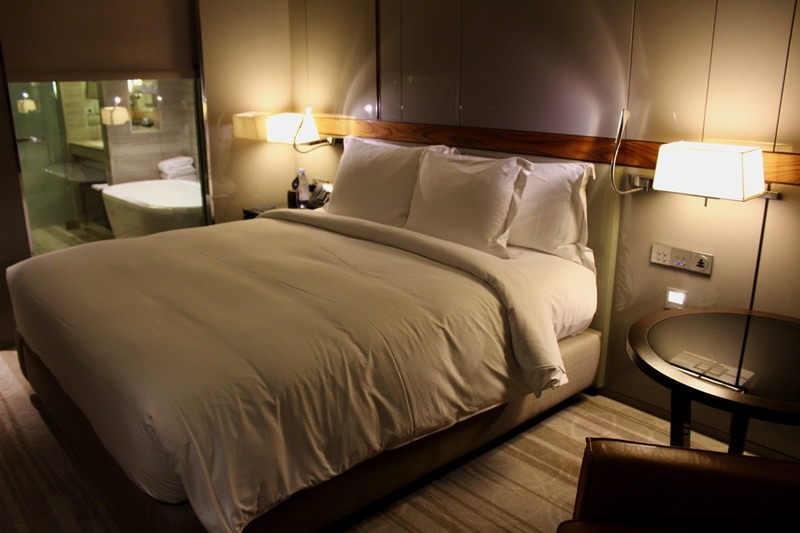 You could book your luxury stay on a click here! Would you like to enjoy the same hospitality too? Good news! 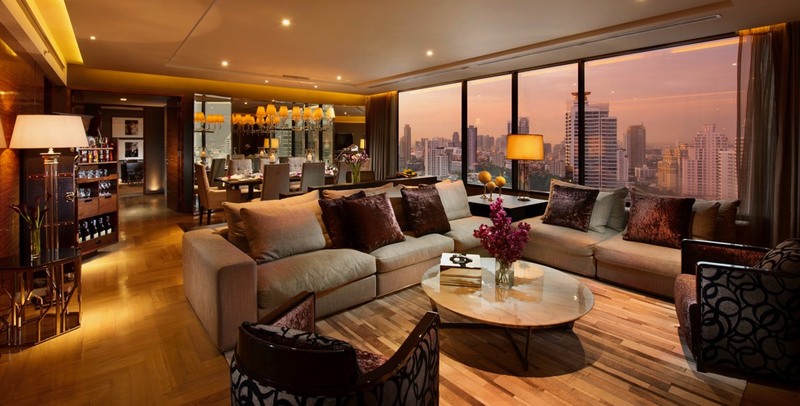 ChicLifeByte would give a couple a chance to live their luxurious dream to enjoy the hospitality of Hilton Sukhumvit Bangkok. Keep checking our Facebook page here.